Egg noodles mixed with tofu, mushrooms and fresh vegetables in a dark soy sauce. 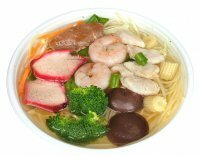 Egg noodles with prawns, beef, pork and chicken served with fresh vegetables in a chicken soup. Noodle Canteen now offers group catering! Does your next office do or social event need a fast tasty buffet that everyone can enjoy? Want to satisfy the troops and keep it cost effective? Your local Noodle Canteen is now offering custom made menus including finger foods for lunch and dinner. Simply email us your details and we'll be in touch to make your event a success. Are you hungry? 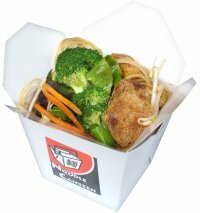 Noodle Canteen serves delicious, freshly cooked noodles, fast in a box. The best thing about Noodle Canteen (besides our delicious variety of dishes) is that we only use fresh and natural ingredients. No MSG is used in our food. But if our menu selection is not to your taste, feel free to pick and choose from a wide range of fresh ingredients to create your own unique noodle box. Noodle Canteen is not your average noodle takeaway – it is a hidden gem. Our dishes are an assortment of wonderful flavours, mouth watering noodles, and uniquely textured vegetables that makes it different from any other noodle bowl in town. Our quality is consistent, our meals expertly prepared and our prices can’t be beat. If you want food that is healthy, fresh and bursting with flavour, head down to your nearest Noodle Canteen where every meal is a delightful experience! Healthy and yum when you're on the run.